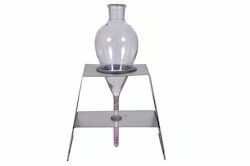 Manufacturer of a wide range of products which include centrifuge tube with stand magnaflux, 8a red powder, dye penetration material magnaflux, ketos mpi test ring, mg-2410 wet method fluorescent magnetic powder and gauss meter. 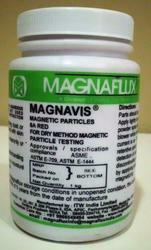 Magnaflux 100 ml Centrifuge tubes are used to monitor the bath concentration and level of contamination of the magnetic particles in Magnaglo® or Magnavis® baths. Applications: Magnavis® Dry Method Non-Fluorescent Magnetic Powders are used to identify indications in welds, large forgings and castings. 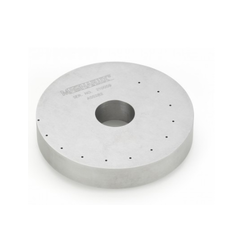 The Magnaflux Tool Steel Test Ring is a mag particle test Piece with pre-drilled holes to simulate subsurface discontinuities. It offers a reliable method of verifying magnetic particle system performance when actual test parts with discontinuities are not available. 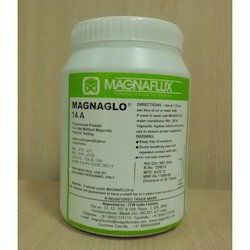 Magnaglo® MG-2410 Wet Method Fluorescent Magnetic Powder is a dry, free flowing magnetic powder that fluoresces bright yellow-green under black light (wavelength of 365 nanometers). Magnaglo® MG-2410's bright fluorescent yellow-green color provides a vivid contrast against metal parts when viewed under black light in a darkened area but does not require total darkness for viewing. MG-2410 is closely controlled to assure optimum batch to batch consistency and inspection reliability and can be used with either water or oil vehicles. 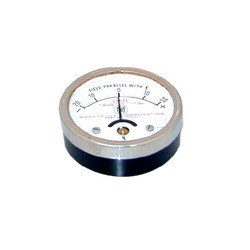 We have western make (Made in canada) Gauge meter for using magnetic testing inspection. We are the authorised dealer for Magnaflux (ITW INDIA LTD) Company. 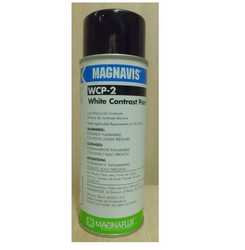 We provide WCP-2 White Contrast Spray at reasonable prices. 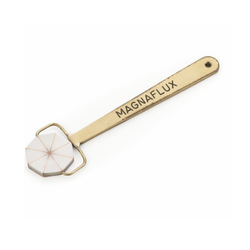 We have all products available in Magnaflux Brand. Spotcheck® SKD-S2 is a non-chlorinated solvent developer that meets major requirements for special alloy and nuclear applications. Spotcheck® SKL-SP1 is a solvent removable penetrant offering maximum reliability in the detection of surface-open flaws and discontinuities. Spotcheck® SKL-SP1 is a solvent removable (or post emulsifiable) red color contrast penetrant with outstanding penetrating characteristics. It offers maximum reliability in locating surface-open flaws and discontinuities and has been successfully used on non-porous ceramics and other similar materials. Temperature: SKL-SP1 should be used at temperatures between 40° F to 125° F.
Meticulously designed, our dual magnetization yoke and portable MPI unit (AC / HWDC Yoke) and MPI Portable Unit are high in performance and are easy to operate. With strong and rugged construction, these are suitable for continuous operation. The portable MPI units offered by us are intricately designed for continuous operation and efficiently yields accurate results. Based on latest technology, our units are available in various models. Our immense industrial expertise and sophisticated machinery aid us in manufacturing and exporting an exclusive array of magnetic particle testing accessories. These are stringently checked by our team of quality controllers and are available in customized ranges. 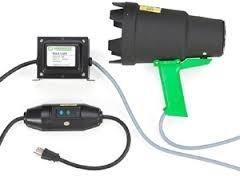 Below Mention All magnetic particle testing (NDT) accessories. Rugged, pocket-size meters used to indicate residual magnetism remaining in part after magnetization. 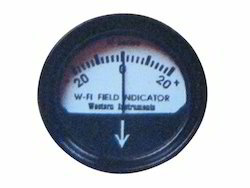 D03010: Non certifiable Field Indicator. Inexpensive, disposable, non certified field indicator. D03003: 20 Gauss Calibrated Field Indicator. Accurate to + 0.5 gauss with scale range of 20-0-20. Certification is provided. D03004: 10 Gauss Calibrated Field Indicator. Accurate to + 0.3 gauss with scale range of 10-0-10. Certification is provided. The Magnetic Particle Pie Gauge is used as an aid in determining the direction of magnetic fields for detection of discontinuities in ferrous metals. Shape: the octagon-shaped piece is mounted on a handle. The Magnavis® Y-1 AC Magnetic Particle Inspection Yoke is the new generation of lightweight, ergonomically designed yokes that improve job performance and productivity by reducing operator arm and wrist fatigue when testing in tight, confined and overhead areas. Up to 30% lighter than other yokes. Ergonomically angled body with soft grip for the improved arm and wrist positioning. 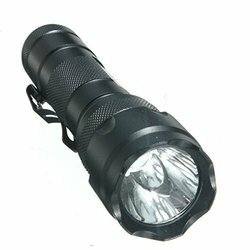 Impact, chemically resistant outer shell. Field serviceable to reduce downtime. Reinforced eyelet for hands-free carrying. Y-1 Yoke Kit Includes Y-1 Yoke – either 115v - 60 Hz/1pH, or 220V/50-60Hz.) One lb. of #1 Gray and one lb. of #8A Red Powder, Paint Marker, SCRUBS™ Hand Cleaner, Powder Spray Bulb, Portable Carrying Case and Instructions. Applications: Automobile Parts, Off-Road Equipment, Farm Equipment, Welds, Castings, Forgings, Leak Testing, Pressure Vessels, Aircraft, Marine, Construction, Maintenance, Petroleum Pipelines, Power Plant Inspections, General Metalwork. 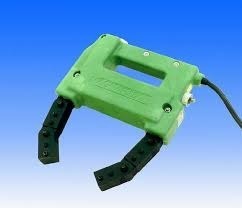 The Magnavis® Y-8 Battery Operated Magnetic Yoke brings battery portability to magnetic particle yoke testing. Kit Includes: Battery Powered Yoke, Charger, Battery Pack with Shoulder Strap, #1 Grey Powder, Powder Spray Bulb, Paint Marker, Scrubs® Hand Cleaner, and Instructions. 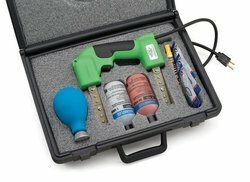 Looking for MagnaFlux Magnetic Testing Instruments-NDT ?